The House Finance subcommittees have proposed a total of $47 million in reductions from the portion of the current budget the Legislature controls. This doesn’t include most of the funding for public schools, which could receive a $10 million increase under a law the Legislature passed last year. Dunleavy proposed $794 million in cuts to state agencies, including $323 million in school reductions that would require repealing portions of last year’s law. The largest proposed cut by the House subcommittees was to the Department of Corrections, with a proposal to increase the use of community residential centers — similar to halfway houses — and electronic monitoring. Both are less expensive than housing offenders in prisons. But the subcommittee didn’t adopt Dunleavy’s proposal to send some inmates to out-of-state prisons. The second-largest proposed cut by the subcommittees was to the Department of Health and Social Services. Most of this reduction is due to the 2016 law that overhauled the state Medicaid program. The House subcommittee didn’t adopt the additional Medicaid reductions that Dunleavy proposed. The governor may be able to reach some of those cuts administratively, working with the federal Centers for Medicare and Medicaid Services. But most of those cuts will require the Legislature to act. House minority-caucus Republicans declined to vote on some of the subcommittee recommendations. Rep. Lance Pruitt, an Anchorage Republican, said the House majority should have started with Dunleavy’s proposal as a basis. Now the budget is in the full House Finance Committee. Rep. Neal Foster, the committee’s co-chairman, said he’s planning to introduce a new version of the budget bill on Thursday. The House majority has a goal of having the budget reach the floor for debate by April 8 — six days before the scheduled end of the 90-day legislative session under state law. The Legislature has more time under the state constitution, which sets 121 days — ending on May 15 this year — as the maximum session length. Majority-caucus senators have indicated they’re seeking deeper cuts than what the House has proposed so far. It’s not clear how much lawmakers will consider Dunleavy’s line-item veto authority as they work on the budget. The overall gap between what the state is set to spend under current law and what it’s expected to raise in tax, fees and oil royalties is roughly $1.5 billion. One area that could take some pressure of the budget is savings. Dunleavy has proposed spending up to $172 million from the statutory budget reserve and $180 million from Alaska Industrial Development and Export Authority reserves. But those are strategies that can only be pursued once, before the state government would need to find a long-term solution. 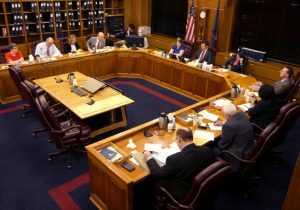 Much of the budget gap could be closed by reducing Alaska Permanent Fund dividends. Balancing the budget with only PFD cuts would lead to dividends of roughly $600, according to a House Finance Committee presentation made at public meetings across the state last weekend. To have dividends at the same $1,600 level as last year would require $600 million in cuts. And having the full $3,000 dividends under the formula set by state law would require $1.5 billion in cuts. Senate Democrats in the minority caucus have proposed eliminating oil production tax credits to close most of the budget gap, but neither of the majority caucuses have advanced a similar proposal.